MAP, Transvaal. Map of the Transvaal and the surrounding territories. 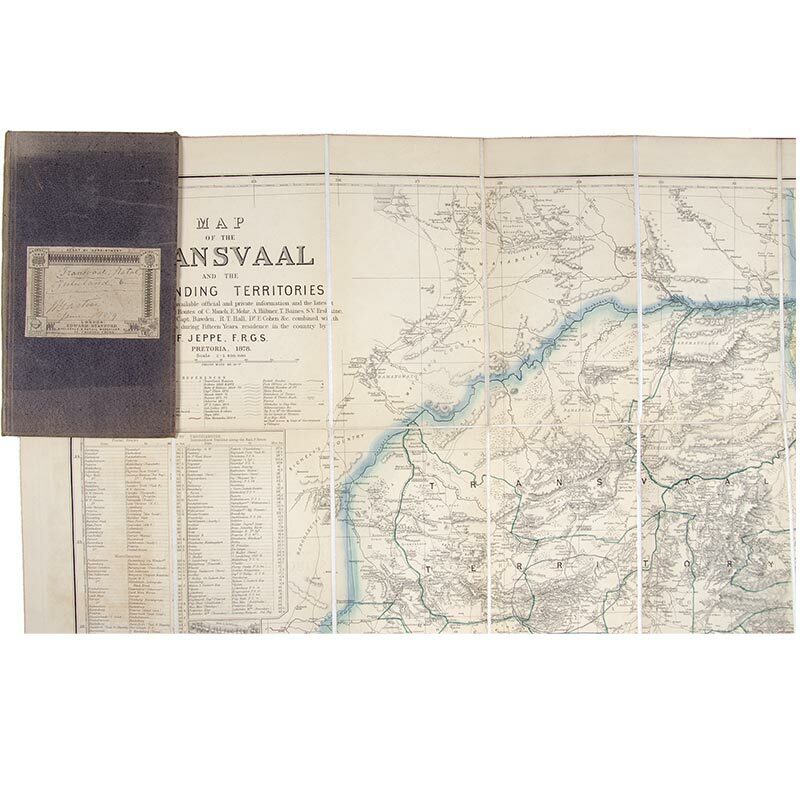 MAP, Transvaal. Map of the Transvaal and the surrounding territories. Compiled from all the available official and private information and the latest observations and exploring routes of C. Mauch, E. Mohr, A. HÅbner, T. Baines, S. V. Erskine, Capt. Elton, Col. Colley, Capt. Bawden, R. T. Hall, Dr E. Cohen &c. combined with his own observations during fifteen years residence in the country by F. Jeppe F.R.G.S. Pretoria, 1878. Scale 1: 1.850,000. London: Edward Stanford, 1879 Engraved folding map with outline hand-colouring dissected into 18 sheets [24 x 25 inches] folding into grey cloth covers. A fine detailed map showing the countries of Transvaal, most of Orange Free State, Griqua Land West, Basuto Land, Natal and Zulu Land with inset maps of Pretoria, the Zimbabwe ruins, and Lourenáo Marques. Occasional neat annotation to the map in a contemporary hand, spine and covers showing signs of fading, a very good copy.